Ben Sparaco and The New Effect, the Nashville-based indie-rock trio fronted by songwriter, guitarist and vocalist Ben Sparaco, have announced their national spring tour which includes headlining shows as well as direct support slots with G. Love & Special Sauce. Tickets for all dates are on sale today (2/15). 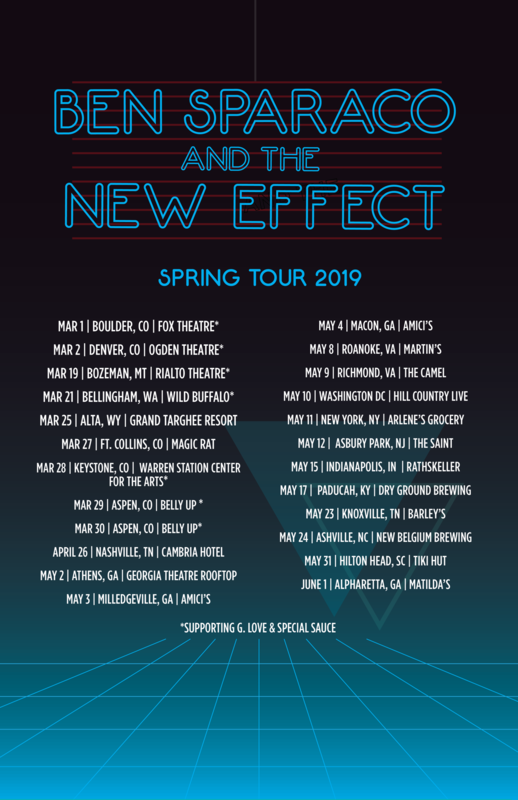 Ben Sparaco and The New Effect will hit the road on their 26-date tour with the inaugural show Friday, March 1 in Boulder, CO at Fox Theatre as direct support for G. Love & Special Sauce. An additional six dates in the tour’s coast-to-coast itinerary will accompany G. Love & Special Sauce while the others will be headlining engagements. The tour will make additional stops in Denver, Aspen, Nashville, Athens, Richmond, Washington D.C., New York City, Asbury Park, Indianapolis, Asheville, Charlotte and many others before wrapping in Alpharetta, GA at Matilda’s on Saturday, June 1. To wrap the band’s 2018 year, they released their latest single, “Scared of The Dark,” on November 30. The song—which delivers the band’s alternative vibe with a jam element, built from Sparaco’s notable lead guitar chops—has been steadily grabbing attention as it’s now logged over 130,000 Spotify streams to date.